Known awards are listed below. There may be others yet to be identified. 20786 Serjeant John Joseph Richardson, 6th Battalion, the Machine Gun Corps died of wounds 7 July 1918 and is buried at Nine Elms British Cemetery, Poperinge, Belgium. He was 28 years old. 13/400 Sapper Arthur Kenneth Atkinson, 206th Field Company, Royal Engineers was killed 3 December 1918 when salvaged German ammunition exploded and is buried at Soumoy Communal Cemetery, Belgium. He was 22 years old. 250440 Private Oliver Rushford, 1/6th Battalion, the Durham Light Infantry was killed in action 30 June 1918. He has no known grave and is commemorated on the Soissons Memorial, France. He was 24 years old. 250523 Serjeant Thomas W. Simpson, 1/6th Battalion, the Durham Light Infantry was killed in action 27 March 1918. He has no known grave and is commemorated on the Pozieres Memorial, France. He was 27 years old. 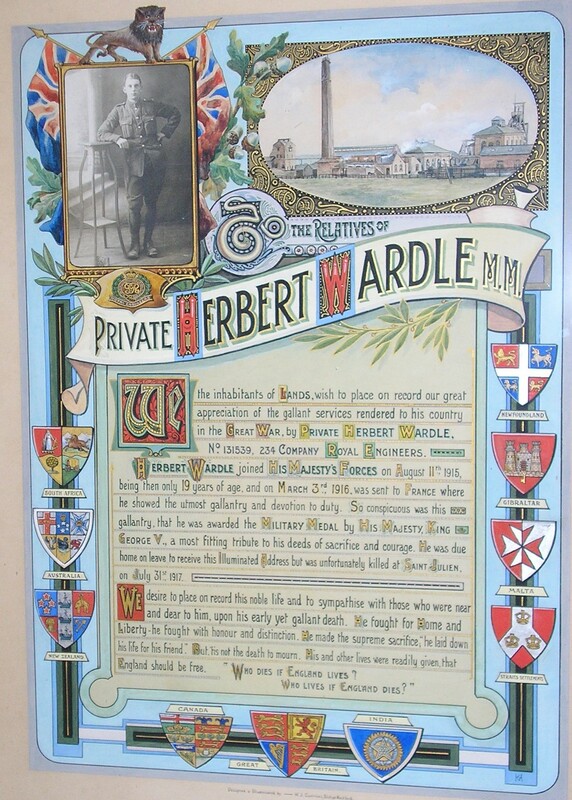 131539 Sapper Herbert Wardle, 234th Field Company, Royal Engineers was killed in action 31 July 1917 and is buried at New Irish Farm, Ypres, Belgium. He was 20 years old.